“La vie heureuse” is a phrase often used in Tahiti, which translates roughly to “A happy life”. As it happens, there is not much in the way of that when you’re in French Polynesia. From the unbelievably clear turquoise waters to the enchanting waterfalls, mystical valleys, rich cultural history, and fauna bursting with color and life, it is a land that seems almost unreal until experiencing it in person. During my week spent exploring the islands of Tahiti and Moorea, I discovered that French Polynesia is brimming with so much more than just picture-perfect beaches and luxury resorts; that discovery and immersion of all of the artistic and cultural aspects of a different country that make travel so intoxicating for me is all here, in a destination I so easily overlooked previously. 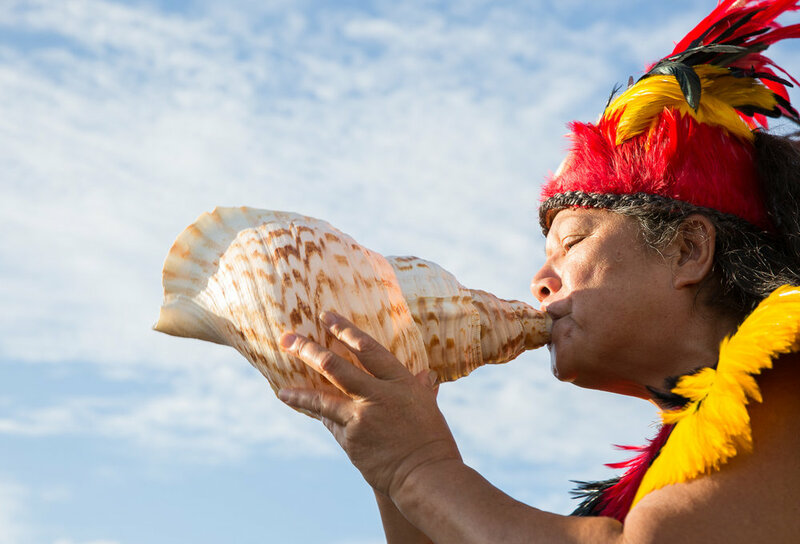 Traditional Polynesian welcome with harmonies from a conch shell at Fa'a'ā International Airport upon French Bee's inaugural flight from Paris > SF > Tahiti. 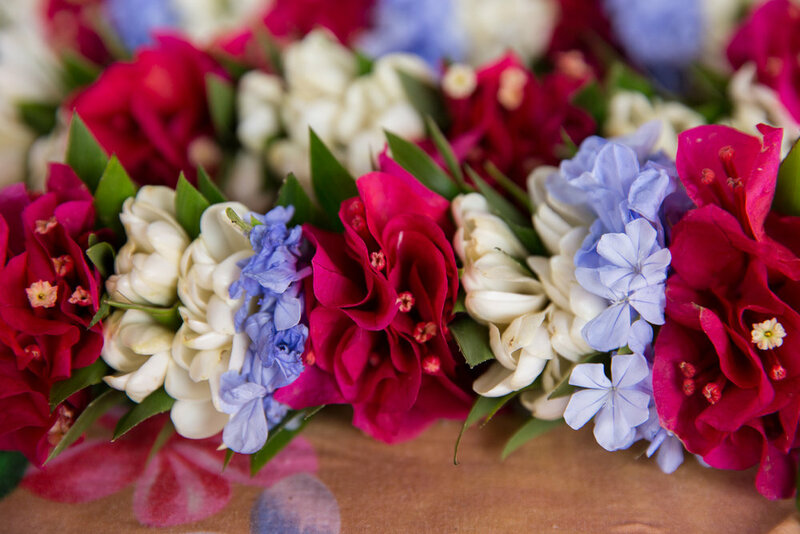 Upon landing at Fa'a'ā International Airport just before sunrise, we were immediately greeted with a fragrant jasmine lei, the sweet smell instantly bringing attention to the fact that yes, we had just arrived in paradise. Rhythms of Polynesian drums and mellow guitar melodies bounced off the walls as dancers swayed to the music, smiling at us as we began a week of unforgettable adventures. In this write-up, I’ve gathered my highlights of where to stay, play, discover, and eat on these two magical islands, honeymoon or husband not necessary. In fact, all of these locations would make for a fabulous girls trip or solo getaway, depending on your travel preference. Happy trip planning! 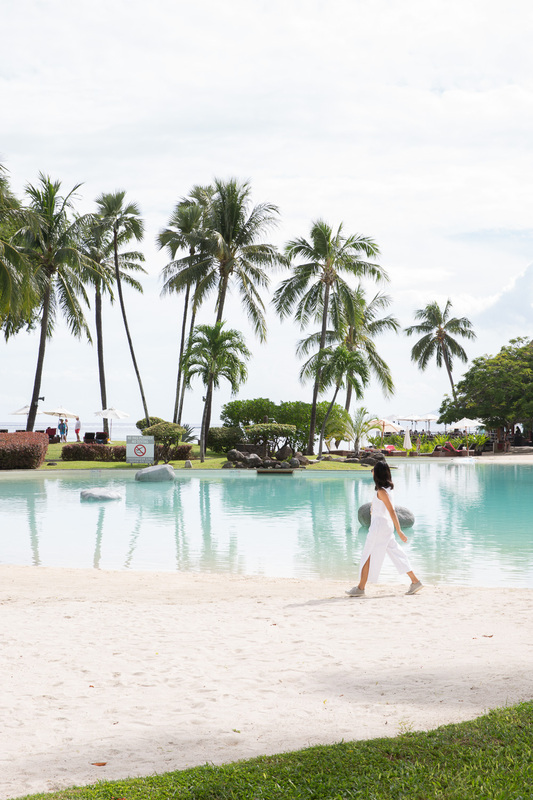 While Tahiti certainly has no shortage of accommodations, from 5 star resorts to guesthouses and humble yet cozy family-run pensiones, I felt completely relaxed and at ease upon checking into Le Meridien Tahiti. Refreshing myself with the Malin + Goetz amenities, I immediately took a walk around the grounds to gaze out at the idyllic overwater bungalows, waves gently lapping on the shore, and waded through the lagoon. 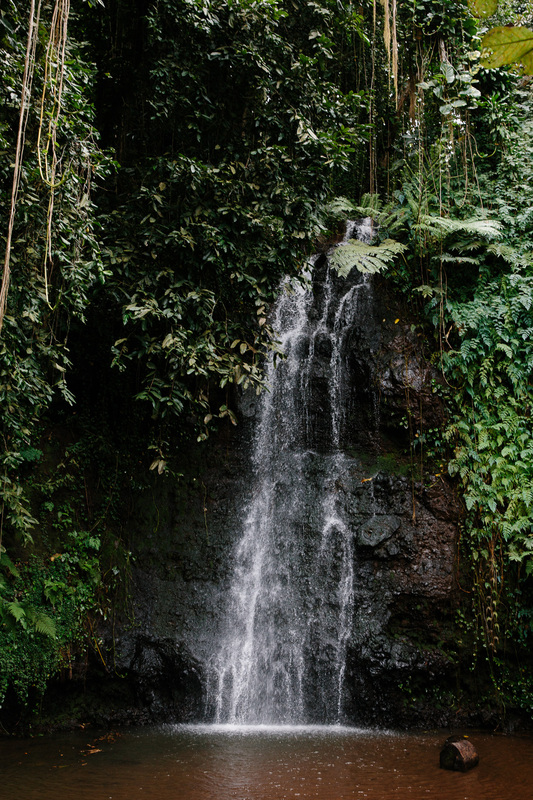 Tahiti’s mountainous interior is rich with stunning landscapes of full of streams, waterfalls, trees of tiare, aka the Tahitian gardenia, the most ubiquitous flower on the island. A “circle tour” around the perimeter of the island with stops at significant maraes is a great way to get a sense of the culture and history that binds the Polynesians together. Maraes were sacred gathering places for religious and social rituals, many times for prayer and sacrifice to the Tahitian gods for good fortune and abundance. A rectangular structure of carefully selected basalt rocks, many of the maraes standing today have been lovingly reconstructed by Tahitians eager to preserve their culture and share it with visitors and the next generation. While there are a few tour operators that do the “circle tour”, its also possible to rent a car or a driver and do this at your leisure, skipping stops that don’t interest you or lingering at the ones that do. A couple of my favorite stops, pictured below, included Marae Arahurahu and Mara’a Grottoes. 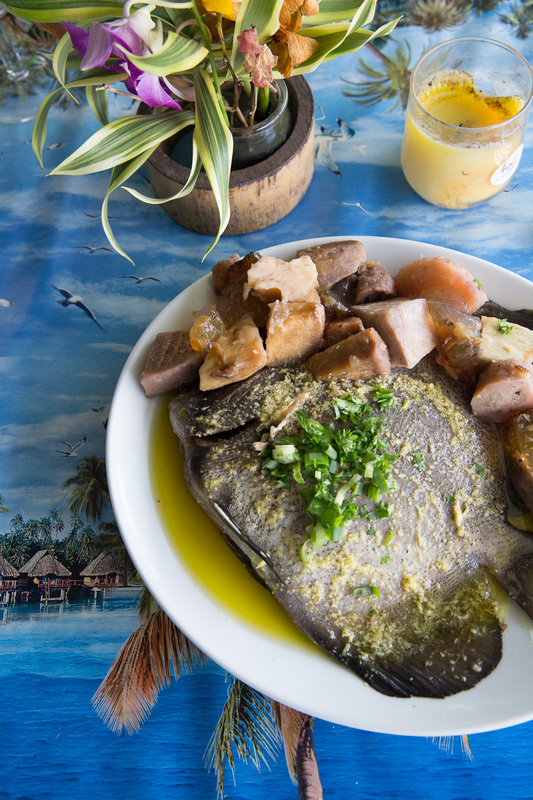 Being an island, Tahiti is a seafood lovers dream. Fresh, quality seafood can be found at almost any restaurant, many times inexpensively if you’re having the local favorite- poisson cru. 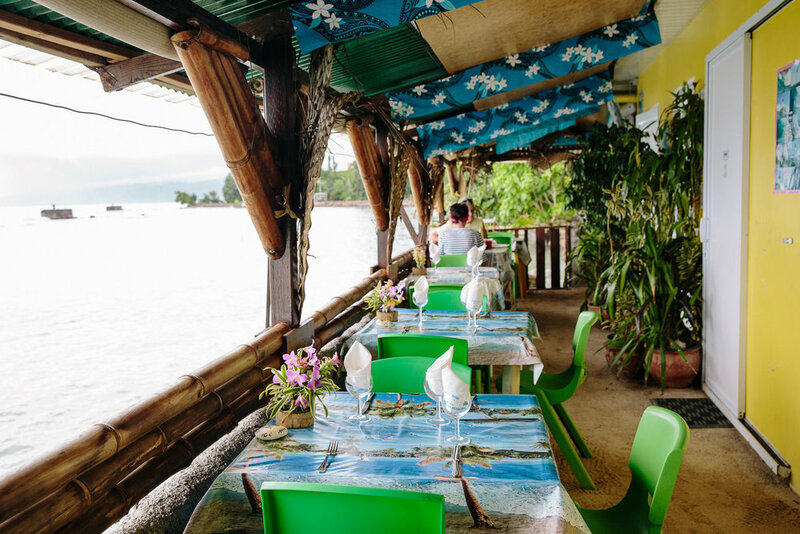 One of the most memorable meals for us was on our way back from Teahupoo, at a deceptively humble restaurant on the side of the road called La Plage de Maui, decorated with charming mix of Tahitian kitsch and maritime tchotchkes. 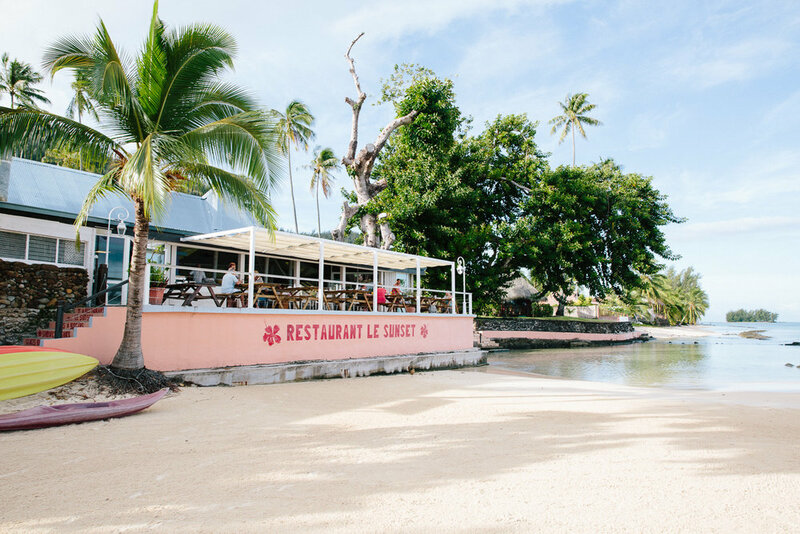 A mix of French and local Polynesian flavors, every dish here from the appetizers to the dessert was authentic and delectable, made with so much love and warmth. It was a tough decision but I ordered Paraha Peue from Vairao’s Lagoon - fresh whole fished steamed with ginger olive oil and local root vegetables and it was gone in minutes. Tables facing the Tapuaemaui Bay, named for Maui, a Tahitian legend who lived near this bay. If you have limited time to spend in French Polynesia, 2 days is sufficient to get a feel for Tahiti, the cultural center of the islands, and then hop on the Terevau ferry onto Moorea, which is one of my favorites of the Society Islands. A captivating blend of adventure, nature, relaxation, and culture, Moorea is only a 30 minute ferry ride away yet feels like a world apart. Tickets for the Terevau can be purchased online or in person, and there is a comfortable cafe on the upper level with drinks and snacks as you watch the ferry come in carrying a mix of locals and visitors. We ate our fruit while gazing out here and fell in love with Moorea right away. After breakfast on the beach, we headed inland and up the mountain to drive through Moorea’s pineapple plantations. It was incredible watching the landscape and climate change as we ascended the mountain in a 4x4 Jeep. From the warm sunny breeze on the coast, the air gradually became cooler and mistier, adding to the mystique of Tahiti’s extraordinary landscape and of course, making for some gorgeous landscape shots. Tahitians come from an incredibly rich history of rituals and traditions, so a hands-on experience is no doubt the best way to immerse yourself in Polynesian culture, at least for a few hours while at Tiki Village. 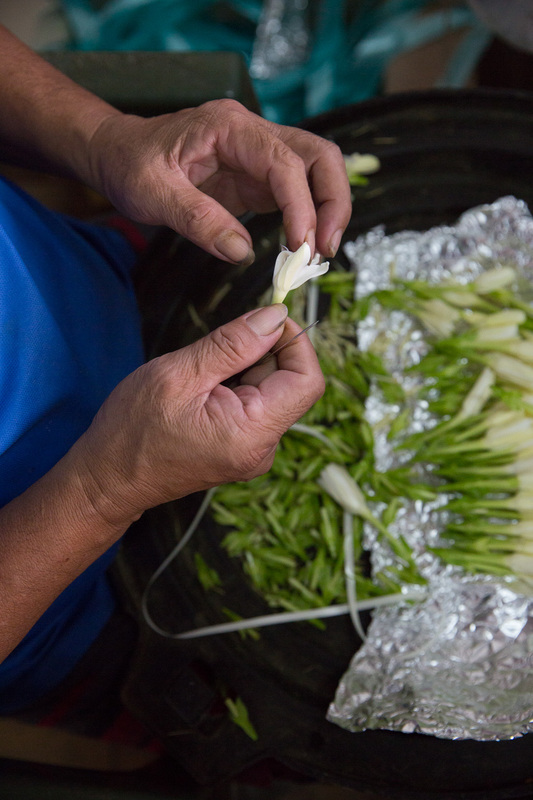 For me, a cooking class is always an enjoyable way to experience local ingredients and learn cooking techniques practiced in the region. 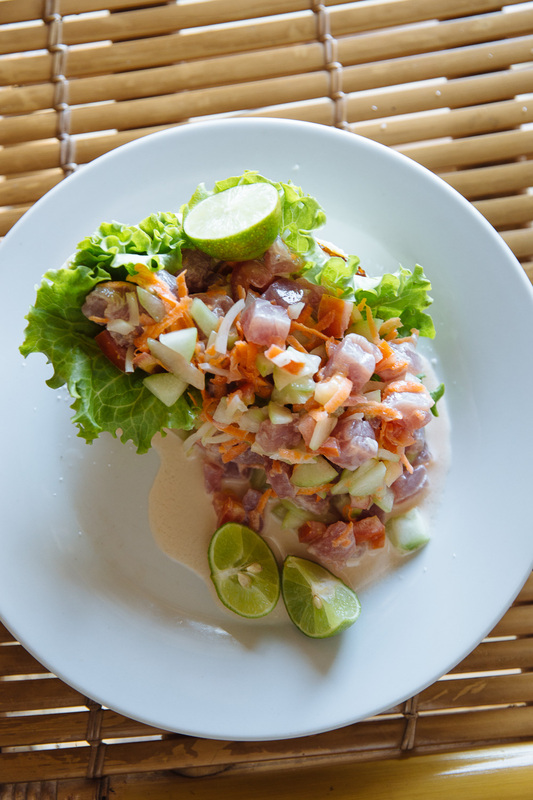 Although it didn’t involve any technical “cooking”, I loved seeing how simple it was to make the popular Tahitian dish - poisson cru - fresh raw tuna marinated in coconut milk, lime juice, salt, and pepper. Like my mantra for California cuisine, less is more in this case, and the fresher and simpler the ingredients, the easier it is to prepare a delectable dish thats both healthy and appetizing. As in Tahiti, there are many options for accommodations in Moorea, and I was grateful for a warm and welcoming stay at the Intercontinental. Its sprawling grounds with lagoons and pools are easy to navigate, and there is so much to experience on site. Rent kayaks or stand up paddle boards, take an exercise spin class in one of the lagoons, indulge in the spa (below) or gain awareness about the sea turtle conservation efforts at the Te Mana o Te Moana Association, an independent non-profit with a mission to conserve and rehabilitate sea turtles and educate children about marine life. (The group is independent but their offices are on the Intercontinental grounds). With its distinction as the first spa in Tahiti, Helene Spa has a lot to live up to, and from my immensely relaxing experience there, it exceeded my expectations. 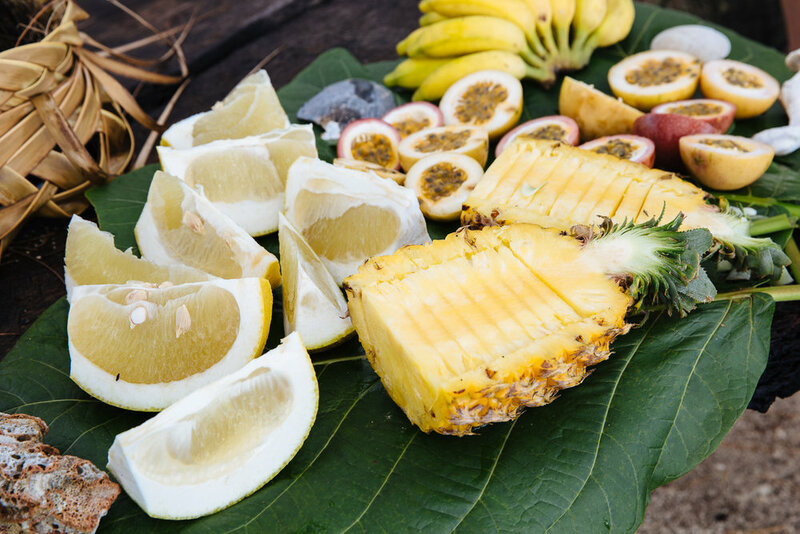 I loved how much all aspects of the spa showcased the natural qualities of the islands, both through the indigenous ingredients and various treatments that stem from ancient Polynesian healers. If you do indulge, arriving early to settle in and relax is highly recommended. Prior to your treatment, you have the option of soaking in the river bath or the rain shower - while I opted for the rain shower, it seems like either choice is equally calming. During the massage, I chose from the monoi oil, tiare oil, or coconut oil, all naturally harvested, and sank into a deeply relaxed state. Every bit of the experience felt so personal and soothing. I emerged feeling renewed, not wanting to leave this cocoon of comfort. Guests have the option of soaking in a traditional river bath at Helene Spa before treatments. Stunningly gorgeous flower bath that looks up to views of the mountains. A few of the natural ingredients used in massage and beauty treatments - monoi oil, tamanu, tiare, Tahitian vanilla. On our 2nd day in Moorea, we spent a few hours at the Hibiscus Hotel, a lovely mid-range accommodation option that falls between a guest house and a luxury resort. With its scenic Bali-esque huts situated around the lush green property, it was definitely a place I could imagine spending a few days at. Several of the bungalows are equipped with kitchens and being walking distance from a few convenience stores and makes it a comfortable yet budget-friendly option for a group of friends or a family. Our favorite part of the hotel was the water-facing restaurant, Restaurant Le Sunset, where we had a hearty breakfast of traditional American items like eggs and pastries, but not without a side of poisson cru. We marveled at the serene views and soft island breeze as we lingered over a casual meal that felt as if we were on a friend’s patio. And now for the grand finale of my must-do list- a lagoon excursion with the warmest hosts - Teva and Joanna of TeMoana Tours. Conveniently, we were picked up by boat just outside of Sunset Restaurant after our breakfast (above) and again greeted with fragrant jasmine leis. We sailed around Cooks and Opunohus Bay, witnessing the mountainous peaks rise up from the island as we imagined the explorers who came upon Tahiti centuries ago did. We stopped at a stunningly clear lagoon to snorkel with sharks and sting rays, easily the most memorable experience on the trip. The water was deliciously warm, and the sharks and sting rays simply swam around and beneath us. After another lagoon stop where we saw a variety of fishes, we docked for a delightful lunch of grilled tuna, poisson cru, and island beverages at a table half immersed in water. It was the ultimate island experience and I can’t recommend it enough if you are on Moorea. As it happens, all good things must come to an end, and after a momentous week of new friendships, experiences, and a deeper connection and understanding of this incredible destination, we boarded our flight on French Bee back to San Francisco. With its flexible fares and endless a la carte options for customization, its another awesome option for planning a trip to Tahiti…Bon voyage! If you checked out any of my recommendations above, would love to hear about your experience below! Maybe it’s because I was born on an island (Penang), that I find myself constantly drawn to them when traveling. After hearing about Phu Quoc, a idyllic Vietnamese island in the Gulf of Thailand, I knew it was not only a must-stop on my limited timeline, it was the destination I wanted to end the trip with. That arrangement turned out to be exactly what I needed and continues to be one of my fondest memories of Vietnam. Unlike the charming yet commercialized village of Hoi An (which happened to be pouring rain during my stay) or the overwhelming bustle of motorcycles in Saigon, Phu Quoc is a low key fishing island surrounded by shimmering turquoise water. Most of the north portion remains a dense tropical jungle, much of it having been designated as a national park just recently in 2001. Making my home at Mango Bay Eco Resort, which was a bit of a distance from the cluster of hotels and resorts on Long Beach, was also what made the time there so enjoyable. 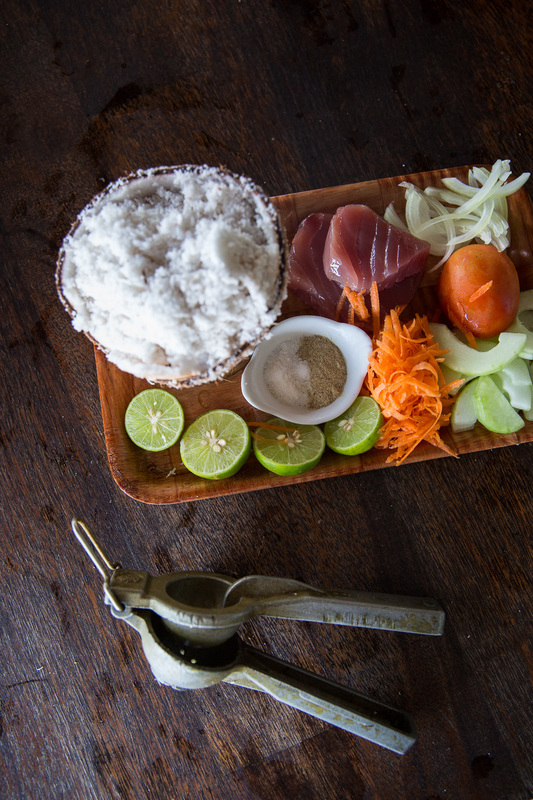 While pepper and fish sauce are the island's main exports, many of the locals make their living off the sea and the activities available in Phu Quoc reflect that. On the first night, I joined Phu Quoc Sunny on a squid fishing excursion. They sent a moped to pick me up and I was instantly transported to my time in Bali, riding through the countryside with the wind blowing through as I gazed at fields, sparse buildings, and street side vendors. We arrived at Duong Dong harbor and climbed onto the barge just before sunset with about 15 other eager squid fishers. Once night fell, we fished alongside other vessels, for as long or as short as our patience would allow. Afterwards, the crew cooked a simple meal of veggies and (what else?) squid and we all ate together illuminated by the boat lamps, washing the savory meal down with Vietnamese beer. The following morning, I went snorkeling at An Thoi, a group of 15 islands just off the southern coast of Phu Quoc. It was the type of day you reminisce about months later; the kind of day spent in a sun-baked haze revolving between sunning, diving off boats, swimming in pristine water, and drying off, punctuated by sips of cold beer and sunscreen reapplication. The boat, also operated by Phu Quoc Sunny, stopped at 3 different snorkeling spots around An Thoi and famed Sao Beach, once a lot more secluded than it has been recently. On the way back to Mango Bay, my driver was kind enough to stop at Dinh Cao Night Market at my request, since I was leaving the following afternoon. 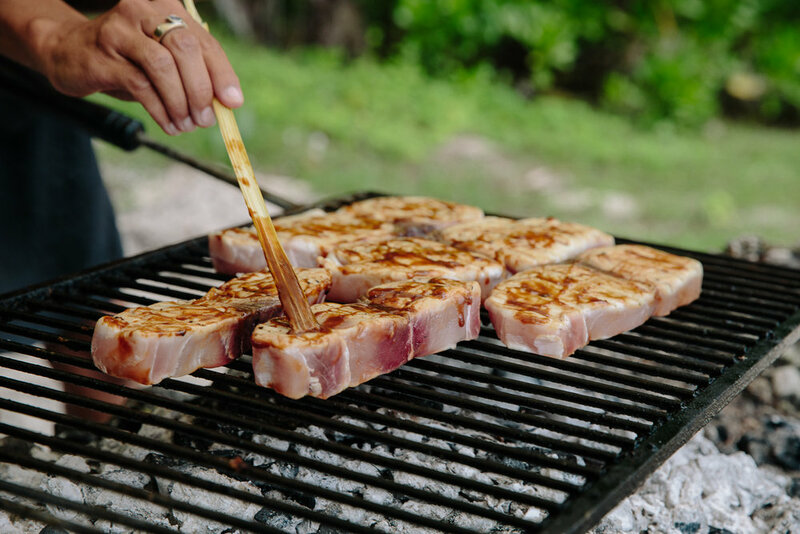 I walked through the lively seafood stalls, ordering freshly grilled shrimp and scallops simply seasoned by the smoky grill and a sprinkle of lime and salt and enjoyed observing locals taking in the sunset. It was the perfect way to wind down a whirlwind trip. Capri needs no introduction. A haven for artists in the early 1900s that later became synonymous with the glamorous lifestyle of the international jet set, Capri's legendary fabulousness continues to permeate the island air today. Simply strolling the streets shaded by bougainvillea, peeking into exquisite boutiques and taking in the dramatic views from all angles, the charm of this 4-mile paradise is apparent. After arriving at via the Gescab ferry from Sorrento, we took the Funicular tram uphill and meandered our way down, stopping for lunch and of course, gelato, along the way. The morning clouds had cleared by then so we decided to indulge in a private boat ride around the south part of the island, the highlight, needless to say. Our skipper Gaetano met us at the port and off we went towards the famous Faraglioni, passing views of iconic Villa Malaparte along the way. The only way to capture the experience seemed to be shooting video; the boat skipping over the deep turquoise waters, each grotto more magical than the other, just the right amount of breeze in our hair under the island sun. We lunched on the top floor patio of Isidoro (the restaurant spans 3 stories), feasting on pizza and pasta while looking out at the Piazzetta and the Bay of Naples. Using handmade perfume techniques that date back to the 1300s, this traditional fragrance boutique is a swanky aromatic stop for gifts/souvenirs. There are no shortage of skippers on Capri eager to whisk you around the island. Don't feel compelled to see every single grotto and spend the entire day on a guided tour; sometimes less is more.